Reading and share top 15 famous quotes and sayings about The Smell Of Flowers by famous authors and people. 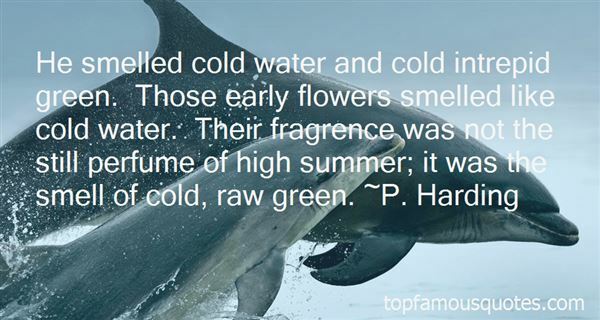 Browse top 15 famous quotes and sayings about The Smell Of Flowers by most favorite authors. 1. "Desert dawn Rise up early, lift your song On the breath of life that rises from the Glowing stone Feel the rock of ages, smooth against your skin Smell the breath of flowers dancing on the wind Dancing on the Wind"
2. "Your life's journey is no longer an adventure, just an obsessive need to arrive, to attain, to "make it." You no longer see or smell the flowers by the wayside either, nor are you aware of the beauty and the miracle of life that unfolds all around you when you are present in the Now." 3. "Nothing can beat the smell of dew and flowers and the odor that comes out of the earth when the sun goes down." 4. "Candleford Green was but a small village and there were fields and meadows and woods all around it. As soon as Laura crossed the doorstep, she could see some of these. But mere seeing from a distance did not satisfy her; she longed to go alone far into the fields and hear the birds singing, the brooks tinkling, and the wind rustling through the corn, as she had when a child. To smell things and touch things, warm earth and flowers and grasses, and to stand and gaze where no one could see her, drinking it all in." 5. 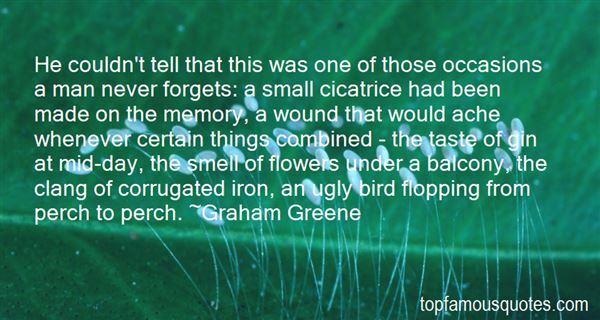 "He couldn't tell that this was one of those occasions a man never forgets: a small cicatrice had been made on the memory, a wound that would ache whenever certain things combined - the taste of gin at mid-day, the smell of flowers under a balcony, the clang of corrugated iron, an ugly bird flopping from perch to perch." 6. "A pettos speckled with gold ajiggle with a fremitus from the heart touches me like Athena's hoolet mewing in uncertain dark. So much is nature, whereon we build our particulars fastidious and critical. Your every arrow O Eros has hit me, as the song goes. O girls, girls. This arrow is Timo's curls, this is Heliodora's shoes, this the smell of quinces that blows from Demo's door, flowers plaited into Dorothea's hair and ox-eyed Antikleia's smile that is music from the islands, summer's stars." 7. "May flowers smell their scent!" 8. 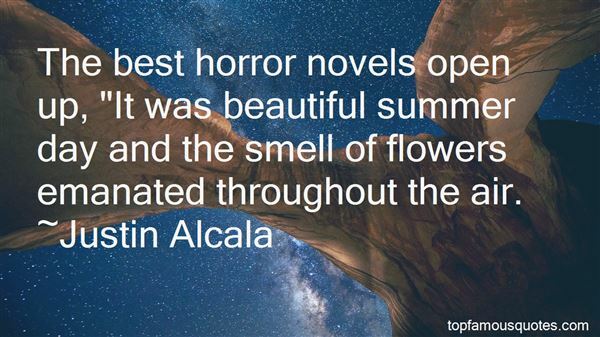 "The best horror novels open up, "It was beautiful summer day and the smell of flowers emanated throughout the air." 9. "If you admire somebody, you should go ahead and tell them. People never get the flowers while they can still smell them." 10. "I love to smell flowers in the dark," she said. "You get hold of their soul then." 11. "It's so nice to get flowers while you can still smell the fragrance." 12. "He smelled cold water and cold intrepid green. Those early flowers smelled like cold water. Their fragrence was not the still perfume of high summer; it was the smell of cold, raw green." 13. "People give flowers as presents because flowers contain the true meaning of love. Anyone tries to possess a flower will have to watch its beauty fading. But if you simply look at a flower on a field, you will keep it forever, because the flower is part of the evening and the sunset and the smell of damp earth and the clouds on the horizon." 14. "I don't want to turn any of this into poetry / but / you're so beautiful / flowers turn their heads to smell you"
15. "You're only here for a short visit. Don't hurry, don't worry. And be sure to smell the flowers along the way." The jewellery I wear on stage in the opera house is not real, but the bling-bling I wear in concerts? Those are real!"